Subscriptions are slowly taking over the app store. From calorie counting apps to text editors, many developers have started shifting their businesses towards recurring revenue. To support the many developers who are monetizing with subscriptions, we’re rolling out a new report that focuses on tracking and analyzing the performance and revenue of subscriptions. 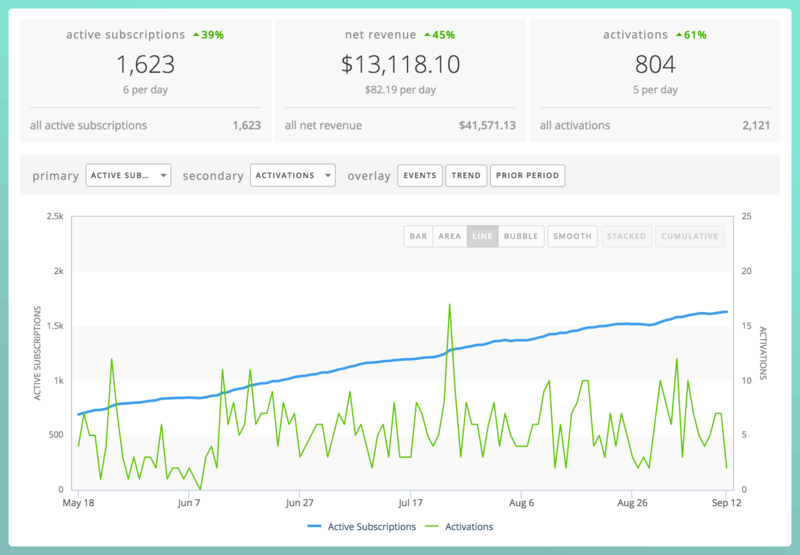 We designed the new subscriptions report to offer a consolidated view that’s easy to understand at a glance but also to dig in. The result is a familiar report that bring together the most important subscription metrics for all of your iOS, Mac, and Android apps. The new report includes all of the metrics reported by the stores, as well as a set of calculated metrics like Churn and MRR and also aggregate metrics like Transitions. The new metrics can be viewed over time, by country, or for your entire app portfolio. Using the built-in overlay system you can also compare different metrics easily. In addition to the new reports, we’ve also add a new route to the API so you can access subscriptions programmatically. Understanding how your subscriptions are working is essential to optimizing your revenue, and our reports provide you with the high level data as well as the ability to really dig in. Go ahead and take the new reports for a spin and let us know what you think. Awesome. Is this for iOS AND Google Play or only iOS? Glad you like it Alex. The new subscriptions report works with BOTH iOS apps AND Android apps on Google Play (and also for Mac apps, just in case). Unfortunately we don’t at the moment. Google makes some piece of information we need harder to get. We will be adding that in the near future. Check out https://appfigures.com/support/kb/583/understanding-subscription-metrics for the complete list of metrics available by platform.